Born on June 13, 1889 in Charleston, South Carolina. Commissioned in the Infantry from West Point in 1912. Served at Vera Cruz, Mexico in 1914 and with the 183rd Brigade, American Expeditionary Force 1918-1919, including the Aisne-Marne Offensive. Professor of Military Science and Tactics at the University of North Dakota 1919-1923. Graduated from the Command and General Staff School in 1925, the Army War College in 1930 and the Naval War College in 1931. Duty at the War Department General Staff 1931-1935. Member of the Infantry Board 1935-1938. Again at the War Department General Staff 1940-1941. Brigadier General in August 1941, Major General in May 1942. Commanding General of 7th Infantry Division in the Aleutians May 1942-June 1943. Commanding General of the Infantry Replacement Training Center at Camp Wheadle in 1943 then 5th Division 1943-1945. Assignments after the war included Commanding General of 6th Infantry Division June-September 1946. Retired in June 1949. Decorations included two Legions of Merit and the Bronze Star. Died on October 12, 1984. 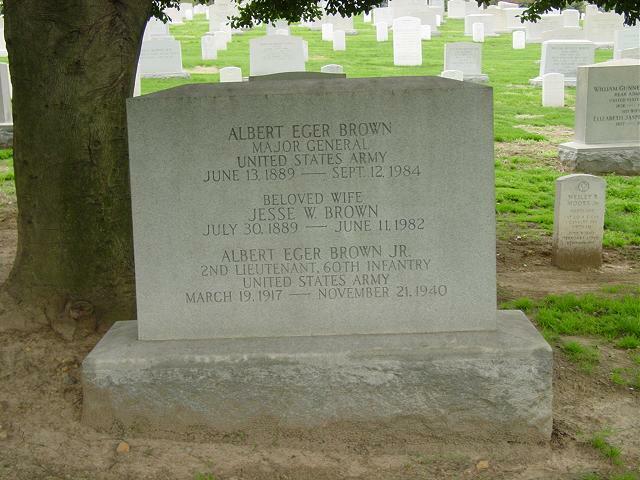 NOTE: Albert Eger Brown, Jr. Second Lieutenant, United States Army. United States Military Academy Class of1940. Appointed from Kentucky. Appointed to the Infantry. Died in an automobile accident in Charlotte, North Carolina, 21 November 1940.